Recommendation: For any T-34 buff who doesn't want to pay high prices, mess with pins, file and fit or heat and fit tracks! A recent special on the history of "Monty Python's Flying Circus" used the now well known bits of John Cleese turning around and saying, "And now for something completely different!" This is one of those cases, and this is one of the most unique new products that I have seen in some time. 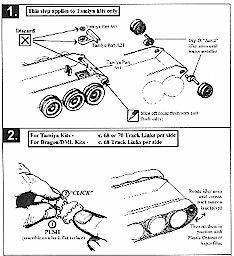 For those of us who build T-34 tanks and their variants, tracks have always been a bit of a problem or a bit of a pain. First there were the Tamiya (or Revell even!) vinyl tracks which unconvincingly wrapped around the wheels and looked awful. They were then followed by replacements in resin or plastic: the resin ones needed heating and shaping to fit, and in some cases were little different from the vinyl ones in appearance; the plastic ones took hours of filing and fitting to get them right, and nine times out of ten you came up one link short (or long) which, with a two-link set, meant problems. Then the next effort was the Fruili white metal ones, which were initially fitted by crimping, and now must have pins cut to fit and installed. All are tedious, and in the case of the plastic and white metal ones, generally expensive (most modelers balk at putting a $35 set of tracks on a $28 model). Now, from Australia, comes a totally new product line from Anvil Miniatures. These are called "Click-Link" tracks, and are made from a very tough, semi-flexible resin which does exactly what the manufactures claim. Assembly only requires snapping an "A" link into a "B" link (the toothed one into the flat plate one) and continuing until a run is complete. There are 80 of each included, which is more than enough to do an entire tank. Also included are two cammed idler adjuster axles, which are for use with the Tamiya kits as they do not include them. This permits at least getting the correct look to the Tamiya kits, which some modelers still prefer to the better DML, Zvezda, and RPM/Maquette efforts. The links are as easy to use as it is to read about them. Empty the bag, take an A and snap it to a B, and continue until you have a run which wraps around the running gear on one side of the tank (even numbers only, so make sure you have an A facing a B at the end!) DO NOT snap them together until you have painted them and the tank, but once done, installation only takes a few seconds. appearance and detail. The links even bear casting numbers and have the correct "hollow tooth" on the A link. More sets for other tanks will follow, but if the quality remains this good and the product this simple to use, Anvil should have a hard time filling orders. Truly a welcome product! Thanks to Brett Green for the review sample. I will forward them to Anvil. Review by Cookie Sewell, March 1998. Page Created 30 March, 1998.